Smoking hot, piping hot, Chelsea buns! ‘Prelates and princes, and lieges and Kings, Hail for the bellman, who tinkles and sings, Bouche of the highest and lowliest ones There’s a charm in the sound which nobody shuns, Of “smoking hot, piping hot, Chelsea Buns”!’ The Old Chelsea Bun House, which sold as many as a quarter of a million buns in one day, was in fact in the Pimlico Road, and the old building was destroyed in 1839. It was run by a Mr Richard Hand and his family, and he was always known as ‘Captain Bun’. He wore a long dressing-gown and a Turkish fez. On Sundays crowds would stream out to the Bun House, which was opposite Stromboli House and Pleasure Gardens. The Bun House also had a museum of freaks, a craze current in the eighteenth century. George III and Queen Charlotte were fond of driving out to the Bun House and would sit on the veranda munching buns to the delight of the curious crowd. He gave ‘Captain Bun’ a half gallon silver mug with five guineas in it. 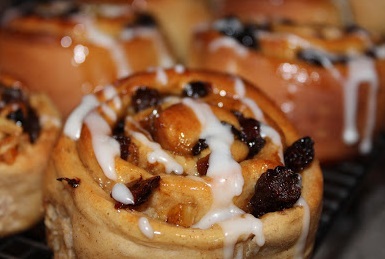 Chelsea Buns are still very popular and perfect with a good cuppa. 2. In a bowl, mix together the milk and egg. Make a well in the centre of the flour mixture and stir in the liquid. Bring the mixture together with a round bladed knife and knead for 10 mins on a lightly floured surface until the dough is smooth and elastic. If the mixture is sticky add a little more flour. 3. Turn the dough out onto a floured surface and roll out to a 30 x 23cm/12 x 9 inch rectangle. 4. Prepare the filling: mix the dried fruit with the soft light brown sugar. Melt the remaining butter and brush over the surface of the dough. Scatter the fruit mixture over the buttered dough, leaving a 2.5cm/1 inch border around the edge of the dough. 5. Starting at the long side of the dough, roll it up like a Swiss roll. Pinch the edges together to seal and then cut into 12 slices. 6. Place the rolls cut edges uppermost in the tin. Cover with oiled cling film and leave to rise for 1 hr or until doubled in size. 7. Pre-heat the oven to 190ºC (375ºF, gas mark 5). Bake for 30 mins or until risen and golden. 8. Remove from the oven and brush with honey and sprinkle with golden caster sugar whilst they are still hot. Then cool on a wire rack. This entry was posted on March 9, 2015 by gabypinkner in Uncategorized.